To be clear: white tigers are not a species or a subspecies. They’re not albino. They are genetic anomalies. Though rare, white Bengal tigers have, in the past, existed in nature; the last known free-ranging white tiger was shot in the 1950s, according to an article at Popular Science. Since that time, white tigers are the product of for-profit breeding programs and, making matters worse, many are hybrids of Bengal and Siberian (Amur) tigers. Kenny died in 2008. If you didn’t mark his passing (you probably didn’t even know about it), don’t feel bad. Kenny, you see, was not the beautiful white tiger on posters for glitzy magic acts. He wasn’t the star attraction drawing crowds of admirers to the zoo. As the product of unscrupulous white tiger breeding, Kenny’s life and death ran under the radar. It was only through the compassion of a wildlife refuge in Arkansas that he was able to live out his life in comfort and even found a modicum of fame – one of the luckiest of the unlucky. He died at 10 years of age from cancer. Kenny’s parents were brother and sister, both carrying the recessive gene for whiteness. 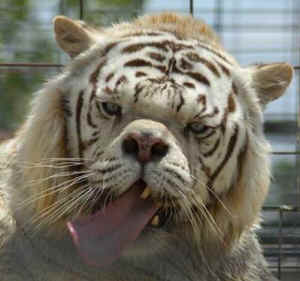 As a white tiger, Kenny inherited double recessive genes. His orange brother was also born with the problem that accompanies this genetic disposition – he was severely cross-eyed. In addition, manifestations of inbreeding include club feet, cleft palates, spinal and other structural issues – and facial deformities, among other maladies. A huge number of the captive tigers are hybrids of various subspecies and are so inbred that they will never be suitable for reintroduction to the wild. No tigers are more emblematic of this problem than white tigers. Only 1 in 30 of the surviving white cubs will be suitable for display. So what happens to the excess orange and black cubs and the white cubs not suitable for display? The white cubs rarely end up in accredited facilities but end up being killed or sold to neglectful facilities. The outcomes for the orange and black cubs are not much better. Most end up being sold into the pet trade, becoming victims of canned hunts, or being killed and sold for parts in the Asian markets.